Spray 4 (6 oz) ramekins with cooking spray. In small bowl, measure pineapple juice. Sprinkle gelatin over pineapple juice. Let stand 5 minutes to soften gelatin. Meanwhile, in 1-quart saucepan, heat whipping cream and sugar to simmering over medium heat. Stir constantly until sugar dissolves. Remove from heat. Stir in softened gelatin until dissolved. In medium bowl, add yogurt and slowly beat in whipping cream mixture with whisk until smooth. Pour into ramekins. Refrigerate about 3 hours or until set. Run butter knife or offset spatula along edges of ramekins to remove panna cotta. Carefully turn upside down onto serving plates. 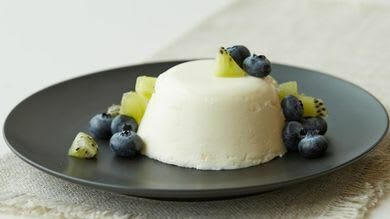 Top with blueberries and kiwifruit, and serve.